There's no need to correct you, Red Devils. I think you have called the second paragraph(beginning with "I think it's a race") correctly. That makes your hypotheses in the first paragraph also correct. There's no need to correct you, Red Devils. I think you have called it correctly. or 3 teams got to the intersection at the same time and TK and Rachel pick a different team..
Maybe Jen is mad, if its her for the title that is, that Rachel & TK had to do the speed bump, and they caught up to her & Nate, like the Goths did now giving TK & Rachel the Goth like "witch powers"? The intersection, if it happens at all, probably happens right at or after Taipei 101. That sighting places a time constraint that is in opposition to expected flight arrival times (esp for TK & Rachel). So, I'm just thinking that there would not be time to have the Intersection board arranged at some other cluebox prior to the 101. The mystery to resolve is how TK & Rachel manage to get to Taiwan customs at the same time as the other teams. Maybe there is the Asian equivalent of Polish Air and the flights will be discovered which make it possible after all. That and a truncated Pit Stop would do it. The fact that Jenn & Nate seemed to have to wait for the next team to arrive may have been a production-imposed edict in order to get side-by-side competing team shots. Maybe a time credit or penalty was effected by this mechanism? I think the title quote goes to Christina. Red Devils has the Christina way of speaking down pat. So, if the Intersection is after Taipei 101 then they loose the footrace with TK & Rachel. And if the Intersection is at Taipei 101, Ron & Christina could be eliminated another way after being Intersected with Don & Nick. Remember how Dustin & Kandice tried to hide for a while from Charla & Myrna? Look at one of Nick and Don's screenshots for the preview of the next episode. What time do you think it is? They couldnt have arrived late could they? Darkness? How could it be dark? I'm starting to wonder if the Taiwan spoiler got the date wrong. Could it have been Saturday July 28 when they were seen at Taipei 101? If it was, that would ease up a lot of inconsistencies. the Asian team , is that possible? to watch the next episode!! Welcome, ChunHan! Nice to see my fellow Taiwanese here. If they have only the usual 12 hour pit stop, the teams would be leaving in daylight the next morning. Where is the shot of Don and Nick (with blue tee shirt seen in other shots in Taiwan) at night from? DID they manage to get there WITH other teams? How do we know that? Could they still be hours behind? My brain hurts today! Or is this just a we know they need to castch up hopeful kind of comment --not that they DID show us that they caught up? just looking at Rachel's smile and tiny little clapping hands makes me think they see other teams ahead in the customs line. That and the Taiwan spoiler placing them with Jenn & Nate at Taipei 101 a few minutes later. 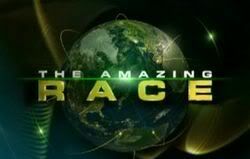 FOUR TEAMS PUT THEIR RACING SKILLS TO THE TEST FOR A CHANCE AT A SPOT IN THE FINAL THREE OF "THE AMAZING RACE 12,"
"Sorry, Guys, 'I'm Not Happy to See You'" — One Racer celebrates her birthday on the Race and the only gift she wants is a spot in the final three, as the remaining four Teams battle it out for a chance to run the final leg and win the one million dollar prize, on THE AMAZING RACE 12, Sunday, Jan. 13 (8:00-9:00 PM, ET/PT) on the CBS Television Network. Phil Keoghan is the host. Some sort of Jeep training course? This looks like where our big red door is. Who's with Nathan? It looks like a random girl puddin. Maybe they have to drive the jeep with an instructor just in case? Yeahs shes asian and not Christina, lol. Looks like a roadblock, I guess. About the intersection. i think the show realized after what a disaster it was last year it should have been taken it. It turned into a three hour yield for the Beauty Queens. It would also seem very unfair to have a intersection basically saving TK and Rachel, but then again they did put two non eliminations right after each other [giving Danielle and Eric and free pass]. I think they are goggles peach, I can't see someone acutually drowning in that shallow water.